A few photos of some of the members of our fantastic gymnastics team who worked so hard in training and today a the inter-schools competition. Well done to our KS1 team who won joint first place and a huge thank you to Grace for training with them each week. Tuesday saw our Year 5 & 6 Sportshall Athletics team take part in a competition at Watford Grammar School for Girls. After weeks of preparation and early morning training sessions we felt ready and able to compete. We were up against 6 other schools in a series of races and field events, including the obstacle relay, over under relay, other relay races, jumps and throws. The events were split into boys and girls events, and everyone got an opportunity to compete in at least 4 different events. Everyone gave it their all, ran their hardest, jumped as quickly of as far as they could and threw things with all their might. In the end all of the points were added together to give us a position for the boys and one for the girls. Overall the boys came a very creditable 5th and the girls did fantastically well to finish 3rd, just out of the places to go to the partnership final. Everyone competed well, and upheld our school values, participating with good sportsmanship and positive attitudes. Well done! We enjoyed playing in the Maccabi football tournament this week. The Blue team started well and even though we lost our first game this did not dampen the team’s spirit – Rafi Isaacs made some fantastic saves throughout the game. In each game we progressed and we had a few near goals. The team worked well and some great passes were made throughout the tournament. We ensured that we defended well the team encouraged each other. Even though we did not get through to the next round, the whole team played as a team and had amazing spirit, not getting down if we did not win. The Red team were eager to start the tournament and our first match was against Morasha, where we sadly lost 1-0. Then we played Sinai and we won 2-1, with Asher scoring our two goals- we were on a roll! We then beat Hillel with Rafi scoring a fantastic hat trick 3-1 and Asher made some great saves as goal keeper. A special mention must go the team work and the great passing between Harry, Rafi and Asher. Sadly we didn’t make it any further but we loved our afternoon and Mrs Cohen said that we were definitely the most polite team there! A huge well done to both our teams! On a wet and soggy Wednesday our girls football team competed in the second tournament of the year. They went into this tournament buoyed by their first experience, and eager to improve. The first game went well, with us having lots of possession throughout the game against HJPS. Grace scored and we ended up winning 1 - 0. Our second match was against an extremely strong Akiva A team (they won the last tournament). We were determined not to concede any goals, and achieved this thanks to some good defending and strong goalkeeping from Sophie and drew. A fantastic result! Our 3rd game mirrored the first won, another 1 - 0 win with a goal from Grace. Unfortunately we lost a close match with IJDS A team by a single goal. In our final game we were determined to try and put the loss behind us and push on for another win. We managed this with a 3 - 0 win thanks to a hat trick from Sophie. Unfortunately we just missed out on getting through a a runner up in our group, but everyone played brilliantly, and are making clear improvements in each and every match. 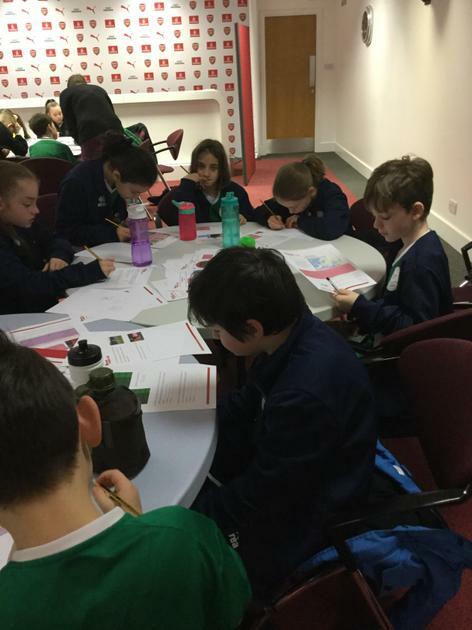 On Monday 14th January a team of 10 Year 5 pupils participated in the Maths Double Club run at the Arsenal training ground. The morning consisted of a range of maths challenges, covering fractions, percentages, ratio, measure, shape and a whole lot more, and a round robin football tournament against 4 other schools. We got stuck into the maths challenges, and worked together to answer as many of the questions as we could. There were some that were tricky, but we all tried our best. 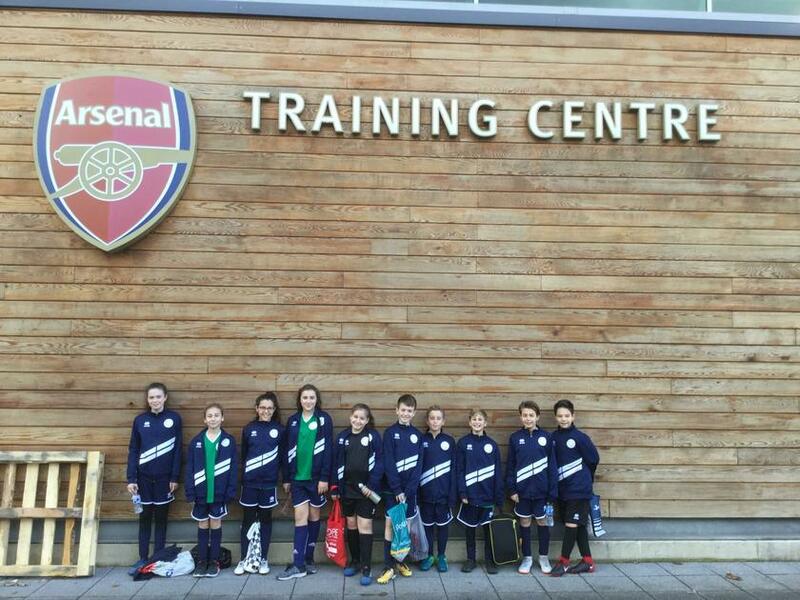 After this we went into the indoor training centre and played in four matches against the other schools. Again we tried our best and persevered, with our best result coming in our final game, a one all draw against St Giles, thanks to a goal from Barney. 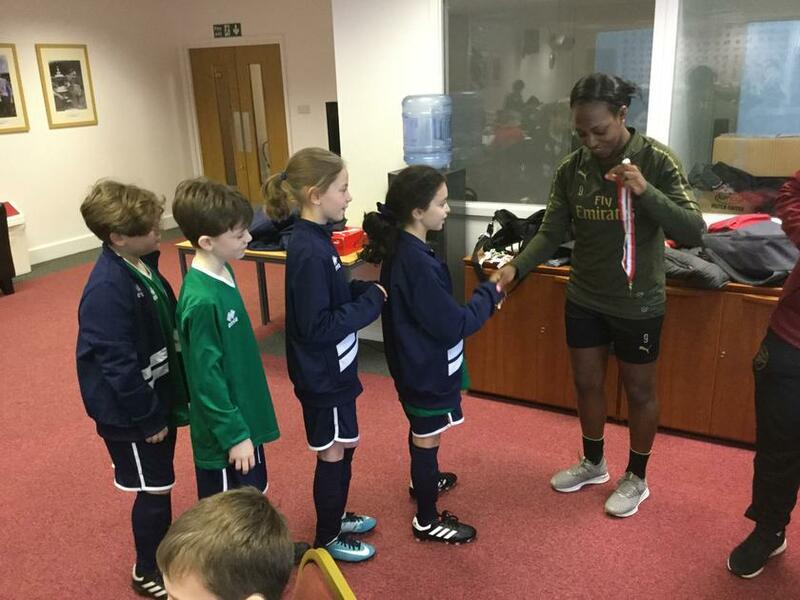 Once the football was over we returned to the classroom and had a Q & A with Danielle Carter, Arsenal Women’s forward, and awaited the results. When the results were announced we were delighted to have come in first place due to our scores on the Maths questions. We received medals and certificates to remember our great morning. On Wednesday 12th December, the netball team took part in the High 5 Maccabi tournament. We enjoyed day, despite the rather cold weather! We entered two teams: the blue team and the green team. The green team won 2 games, including a 3-0 win against Wolfson Hillel. We lost 2 games, with those opponents both qualifying for the semi-finals. The blue team won 2 games and lost 3 games. Miss Winwood was pleased with our effort and we showed a sense of pride with our team work and respect to our opponents. Well done to all of the girls for rising to the challenge of competing together for the first time this year. Today saw our boys take on Meryfield School in our third league game of the season. We were determined to put the defeat in our last game behind us and get some more points on the board. The game started well, we played with the ball in our opponents half, and created a couple of good chances. As the half wore on Meryfield grew into the game, and had some good chances, which were brilliantly saved by Rafi. After some pressure from our forward players Zac managed to take the ball off of their defence, took it past another player and buried it in the bottom corner for a well deserved lead. As half time approached Meryfield put us under increasing pressure, but our defensive players, Dexter, Freddie and Luca were all making excellent challenges and keeping us in the lead. However just before half time, after a series of corners, one of their players got on the end of one, and powered a header into our goal. We went into half time pleased with our performance so far, but determined to try and push for the win in the second half. As the second half wore on there was some more great defending all round, and good chances for both teams. At times Rafi and the woodwork kept us in the game, but we were also very unlucky with a few very close calls of our own at the other end. In all a one all draw was a fair result, on a difficult pitch. All of our players showed determination and a positive team spirit until the end. Well done to everyone who played. 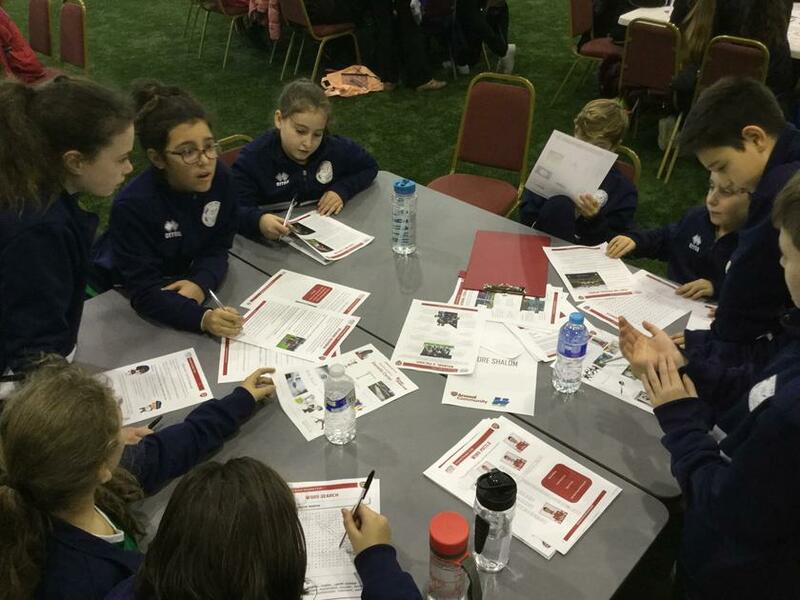 On Monday 4th December a mixed group of year 6 pupils trekked across the fields to the Arsenal training ground, to compete in the Arsenal Double Club initiative. This involves a morning of literacy based activities and football matches, to form part of a friendly competition. We began by completing a range of comprehensions, cloze procedures, wordsearches, anagrams, event ordering and writing tasks. These were time limited and the children worked their hardest to complete as much as they could in the allotted time. Following this we competed in a round robin, 7-a-side football tournament against the other schools (The Wroxham, Oakmere and St Nicholas). We competed really well, winning our first two matches 3 - 2. In our final game against Wroxham we ended up winning 4 - 0 after a strong performance by everyone in our team. 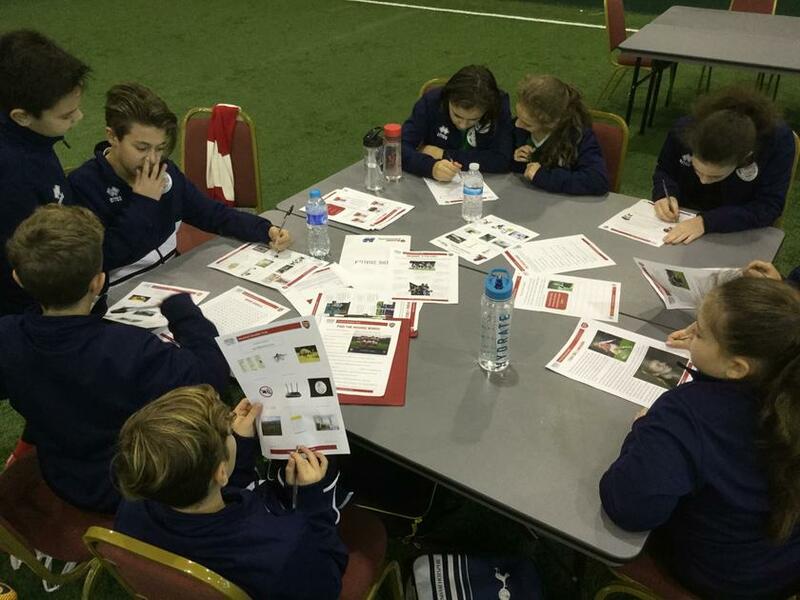 At the end of the football we regrouped with the other schools and reviewed the overall scores. We came a creditable joint second, but more importantly we all had a good time and represented the school well during the morning. Our girls’ football team competed in their first competitive matches of the year at the Maccabi Schools tournament on Wednesday 28th November. The tournament consisted of 33 teams, so we knew that we were in for a competitive afternoon! We had been training hard over the term so far, and were keen to put our tactics into practice on the pitch. Our first match, against our arch rivals HJPS, finished 0-0, despite us dominating the game. We all agreed that we needed to try and improve the accuracy of our shooting for the next game. Our next match was a very even affair, however we lost 1-0 to a very strong Akiva side. Following that came a match against Independent, we finally found our shooting boots, and came out 4-0 winners. In our fourth match we were up against Etz Chaim, who had already put in some strong performances. We competed really well but lost to a last minute goal. Our final game against Beit Schvidler was another one sided match, where we dominated the game but couldn’t find the net, ending in another draw. In all, the team competed really well throughout the tournament, they were enthusiastic and played each and every game in the right spirit. We are all looking forward to our next opportunity to represent the school. On Wednesday 21st November we entered 3 teams of Year 5 & 6 boys into the biggest ever Maccabi schools football tournament, made up of 44 teams. It was a chilly afternoon, and we were all determined to try our best and represent our school as well as we could. We were split into different pools and played a round robin format in against the other teams in our group. 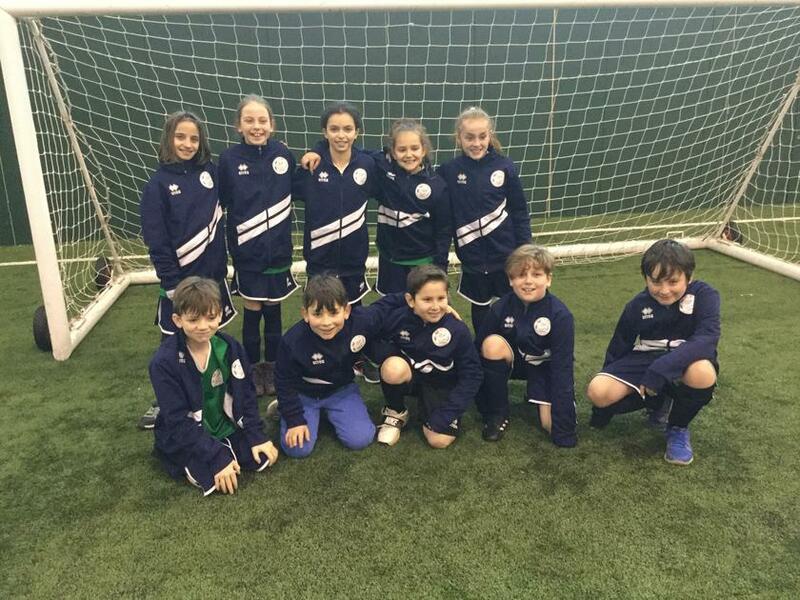 Team 3 competed well in all of their games, especially considering for many of them it was their first time ever representing the school in a football tournament. Despite results not going our way all of the boys that represented this team tried their hardest and didn’t give up in any of their games. Team 2 were extremely determined in each of their 4 matches, but along with coming up against some strong teams they had some unfortunate decisions go against them. In every game Josh was exceptional in goal, he remained determined in each and every game, and at times kept us in the matches. The determination and sportsmanship that they showed throughout is something that they should all be proud of, however they didn’t progress out of their group. Team 1 were in a different group, and started their matches well, drawing the first and winning the second. But with some unfortunate decisions going against them they were only able to draw one more game and lost two. Like the other two teams they didn’t make it through to the latter stages of the tournament. All of our teams represented us well, and were good ambassadors for the school. Well done to each of the boys for taking part. This week we entered two teams into the Hertsmere Sports Partnership basketball tournament, held at Queen's School. This was the first time that we had played competitive basketball, however with a little bit of early morning training we felt ready to go and try our best in representing our school. Each match was 4 vs 4 and lasted for 5 minutes. We were spilt into different pools to play a round robin format league, with the winners of the leagues progressing to the semi finals. Team 1 began well in their first match, winning 2-0, however they lost their second and third matches each by one basket. In the final group match they won convincingly 4-0. Team 2 took a little longer to get going, and lost their first 2 matches against eventual finalists Nascot Wood and Shenley. The final 2 games saw a vast improvement in the marking and determination of the team, however despite scoring baskets in each of the games, they ended up losing each by a margin of 2. Each team represented the school really well, displaying many positive values including; determination, respect and pride. They all improved greatly throughout the day, were supportive of each other regardless of the results, and represented the school in a positive manner. Well done! On October 9th, a squad of Year 6 pupils attended a Quicksticks hockey tournament at Queen's School. They were very excited. On arrival they began a short training session to get used to the astroturf surface that they would be playing on . When they started playing their first match, despite trying their hardest, they found it tough, eventually losing 1 - 6 to Newberries School. Notwithstanding this, they were determined to improve! In their second ever match they tried their hardest again, but having taken a 2 - 0 lead against Nascot Wood, they eventually lost 2 - 7. In the 3rd game, against Chater Junior School, their hard work and determination paid off, as they ran out 11 - 0 victors. The final match of the day against Little Reddings was equally successful as they team put in another great performance to win 11 - 1. After the final points were tallied we found out that we had finished a very creditable 3rd place, a fantastic achievement given that none of our team had picked up a Quicksticks hockey stick until two weeks ago! Well done to each and every school representative for displaying our school values so well, in particular their continual striving for excellence throughout the tournament. A group of eight year 5 pupils competed at Radlett Prep. School in the Hertsmere Sports Partnership cross country event on Tuesday 9th October. After a couple of weeks of training and preparation they were all prepared for a consistently paced approach to their run. After arriving and warming up, the girls' ran in the first race, confident that their approach would enable them all to finish the race. The course was one and a half laps of the field, which had quite a steep incline up one side of it, something that we hadn't been able to train for on our field! The race began and all four of our competitors stuck to their game plan, not sprinting to the front of the leading pack. As the girls reached the bottom corner of the field the four Clore representatives were overtaking people as they continued on their way. A sprint finish from all of our girls enabled all of them to finish the race well, with Amelia placing 9th, Zoe 22nd, Poppy 23rd and Ruby in the top 45. The boys' race began at quite a pace, but again our four competitors stuck to their steady game plan to ensure that they ran to the finish. As with the previous race, come the turn at the bottom of the hill some of our boys were making gains, but the incline proved to be quite an obstacle. It is with credit that all of our boys completed the race, with Dexter placing 29th overall. All of our pupils displayed a commitment to our school values whilst representing us, and all deserve to be very proud of competing in and completing their first cross country race. Well done to Amelia, Ruby, Zoe, Poppy, Dexter, Barney, Luca and Joey.